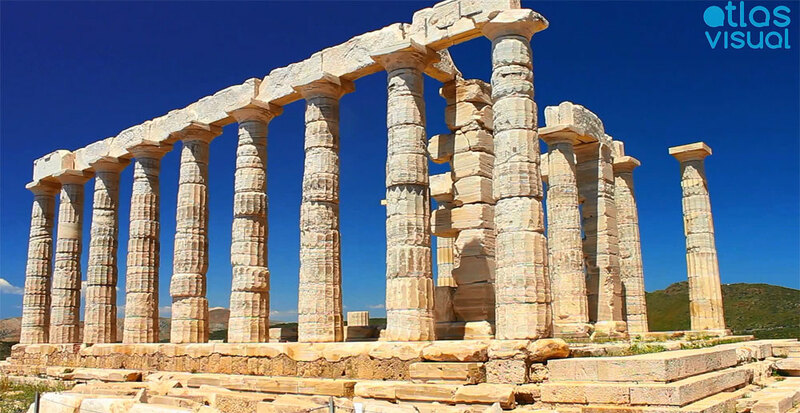 Located about 69 km southeast of Athens, Cape Sounion and the Temple of Poseidon is an excellent day trip. The Temple of Poseidon was constructed in 444-440 BC, over the ruins of a temple dating from the Archaic Period. It is perched above the sea at a height of almost 60 meters, surrounded by the sea on three sides. There is an ethereal atmosphere at the temple and the views at sunset are breathtaking. According to legend, Cape Sounion is the spot where Aegeus, king of Athens, leapt to his death off the cliff, thus giving his name to the Aegean Sea. The story goes that Aegeus, anxiously looking out from Sounion, despaired when he saw a black sail on his son Theseus's ship, returning from Crete. This led him to believe that his son had been killed in his contest with the dreaded Minotaur, a monster that was half man and half bull. The Minotaur was confined by its owner, King Minos of Crete, in a specially designed labyrinth. Every year, the Athenians were forced to send 7 men and 7 women to Minos as tribute. These youths were placed in the labyrinth to be devoured by the Minotaur. Theseus had volunteered to go with the third tribute and attempt to slay the beast. He had agreed with his father that if he survived the contest, he would hoist a white sail. In fact, Theseus had overcome and slain the Minotaur, but tragically had simply forgotten about the white sail.